With everything from ordering books to receiving medical diagnoses migrating from the physical world to the online environment, it’s important for businesses, especially those that shelter the payment and personal information of their client base, to keep every bit of information safe. The recent years have seen an increase in cyber attacks which had a snowball effect, causing numerous organizations to be subject of data breaches, leaks. The demand for cyber security professionals has increased massively in the past years, and a good cyber security specialist can offer companies and clients safety while earning a pretty good salary. That being said, to become a certified information security specialist, you’ll need to meet some requirements. I’m sure that most of you already know that, but for that person who’s just hearing about it, you have to have five full years of paid work in this segment and to pass the CISSP exam. 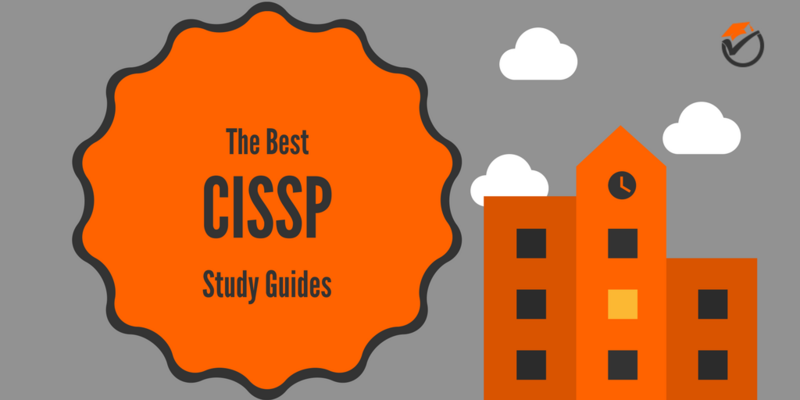 Because of this, we’ve prepared a list of the best materials that you can buy to prepare for the CISSP exam. We’ll be presenting them from most useful to least useful (although they’re all very good materials to have), based on how complete the learning experience will be. Starting off with the Official Study Guide (which has a very catchy full title), we can already notice that this has been published by the authorities responsible for establishing the exam’s subjects of study, which is a big, big plus. This means that this material will give each area the attention it deserves so that by the time you’re finished with it, you’re going to be 100% ready to take the exam. At a closer examination, the book is massive. It has 1536 pages of content that are more than plenty to give each subject the importance it deserves. While this is a pretty big read, it does provide an engaging learning experience, as you’ll get access to the Sybex interactive online learning environment. In addition to that, you’ll get 650 electronic flashcards so that you test your knowledge and assess your areas of weakness and strength. For even more practice, the book contains more than 2,300 practice questions. This product is our best overall pick - the most complete study guide on our list. First of all, this isn’t just a massive book, it’s also very well-written. You’ll have no problem following all of the subjects, as the professionals in charge with designing the exam have first-hand knowledge about how to structure the information, so that readers get a correct exposure. Moreover, it’s written in simpler language, so that everyone will have no problem following the new subjects. Most importantly, it is a complete package - you’re getting plenty of studying materials and plenty of practice materials. The 2300+ questions will provide you with more questions than you can probably handle and, because it’s published in August 2016, it’s very in-synch with the current exams. The only drawback of this purchase is the fact that the Sybex online interactive learning interface is a bit glitchy and might not properly work all of the time. 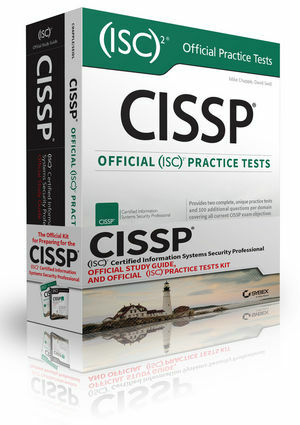 All in all, this is probably the best guide to buy in order to pass the CISSP with flying colors. 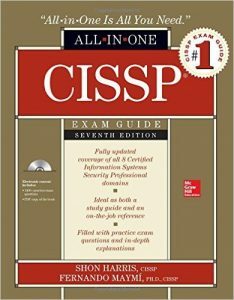 The CISSP All-in-One Exam Guide, 7th Edition, is another guide written by people close to the exam itself. The two writers have plenty of knowledge about how to approach readers and feed them information, systematically, so that they paint a complete picture for each subject that will be present in the actual test. When researching materials, this is the first sign that’s present in quality study guides. The guide itself offers very good value. Similar in price and size to our previously-featured product (although both the price and the number of pages is a bit lower) this offers probably the best value out of all of the 5 guides that we’re reviewing. It has 1456 pages of carefully-written information that’s going to provide you with enough resources to cover all of the subjects in-depth. Published in June 2016, this is also up-to-date and the coverage of the topics will be accurate and complete. You’ll also be getting more than 1400 questions and a complete pdf copy of the book. This guide is similar to the previous one in all ways. It’s written by people who are very well-acquainted with the exam and subjects, it’s very comprehensive and well-written and it’s written in plain English, so that everyone has easy access to the information. The layout of the topics is well-thought and will systematically take you through the subjects, step-by-step, nothing being left out. The 1400+ practice questions are plenty to test your knowledge, helping you determining where to improve. When taking all of these into account, it’s easy to see why this offers the best value out of all the guides on the market. The only problem with the CISSP All-in-One Exam Guide is that the writers sometimes “derail” from the subject, although it offers unrelated examples to offer better explanations of the important topics. That being said, this is a complete, well-written guide, and you should buy it with confidence, as this resource will be enough for you to pass the exam. 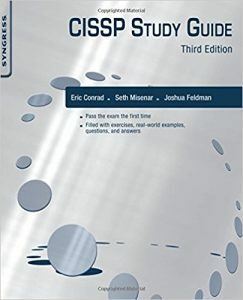 The CISSP Study Guide, 3rd Edition, is published by Syngress, a company that’s known for producing books on cyber security for beginners, advanced hacking and so on. That being said, they really know what they’re about and the topics are written by industry professionals, so you shouldn’t be surprised when we say that this guide covers everything you need to know before taking the CISSP exam. Although they’re not close to the exam in any legal way and do not contribute to the topics, this isn’t such a big deal. With 622 pages of content, this guide is less intimidating and quicker to go through than what we’ve covered before. That’s not a bad thing, as the amount of information is vast and it might be problematic to process all of it in timely fashion. What’s really cool about this particular guide is that it features quizzes at the end of each chapter, so you’ll have the chance to study what you learn before you move on to new topics. This will save a lot of time and is a plus for the layout of the guide, as you’ll get tested on fresh information and consolidate your strengths ASAP. Even better, you still get two full practice tests to sum up what you’ve learned. You might be wondering if this book offers the same amount of detail for each subject, seeing as it’s less than twice the size of what we’ve seen so far. The answer? Definitely. Even though it’s considerably smaller, it’s written by people who’re practitioning cyber security professionals, and they really show that throughout the guide. To better explain each topic, they offer real-life situations in which the information may be put to use, giving it more authenticity and credibility and offering an engaging experience. More than that, the fact that it’s compact can be viewed as a plus, as it will be easier to revisit and review passages that you need to focus on. The only part where it lacks is the practice questions. If you feel that two practice tests are enough to test your knowledge and determine whether or not you need improvements, that’s up to you. Other than that, this is a complete guide that offers first-hand examples from people who work in the industry. Buy an additional book that’s packed with practice questions and tests and you’ll be set. 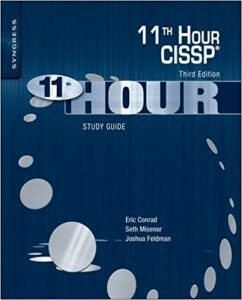 The Eleventh Hour CISSP, 3rd Edition, is written by people who have dozens of years of experience in cyber security. This offers the guide all of the credibility it needs as a reliable source of information. Stated both in the book and in other credible sources, Bryan Simon, one of the writers, has instructed agents of the FBI, NATO and UN in matters of cybersecurity (on three different continents!). With 238 pages, this is more of a summary than an actual guide, so we’ll be treating it as such. The main reason that we’ve featured this on our list is that, judging by the size of the other guides, you might want a lighter read for getting reacquainted with some of the topics, and going through 1500 pages of subjects just to re-freshen your memory is very counter-productive. The information present in this “budget pick” is concise, and you’ll have no issues in reviewing what you already know. It’s important to stress that you won’t make much of this resource if you don’t possess prior knowledge on the discussed subjects. The bad part of this CISSP guide is the lack of practice questions. You won’t be getting much of a testing experience, and that’s a big letdown. + Short, concise and to the point. Does not waste your time. We won’t be spending a lot of time discussing the publishers, as they’re the same people who published the Official Study Guide - (ISC)2, the same people responsible for the structure and subjects of the actual test. That being said, this will guarantee a very accurate testing experience, as they offer the best insights. With 456 pages of practice questions, all at a very affordable price, this is a very good pick for people who want to go into the exam brimming confidence. The 1300+ questions are written mirroring the CISSP test, so you can use this with any other learning resource and get an accurate self-evaluation. Each question comes accompanied by a very detailed answer, so you can use the book on its own after you’ve studied the covered topics. 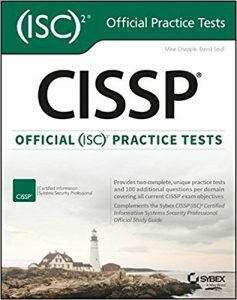 This goes best with the CISSP Official (ISC)2 Study Guide, as they’re written by the same people and will be a perfect match. The only drawback of this is that you can’t use it on its own - you need to have a study guide to use before being able to answer your questions, as the explanations used in the Practice Tests aren’t enough to explain how everything works. As we’ve reached the end of the review, we want to let you know that every material featured in the roundup is very well-written by industry practitioners. It’s important that you get a complete guide and accurate practice tests, so follow our advice and use each material as recommended. We hope that this has provided you with valuable information and that you’re going to pass your CISSP exam with flying colors!